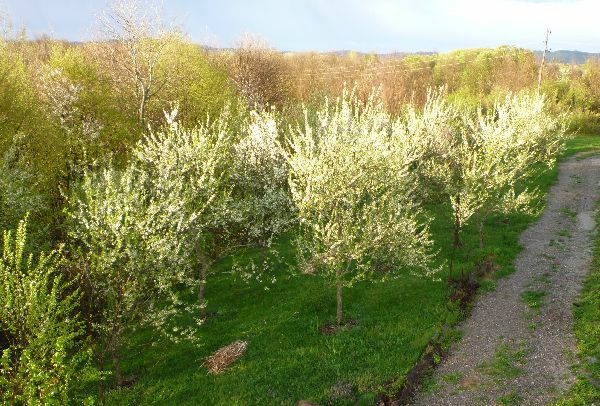 When we bought our house, one of the first things we noticed was a beautiful plum orchard on a north facing slope. Beautiful because the trees were mature and flowering; it was spring. But in the years after, we noticed that we never had many plums. Why were our plum trees in bad shape? - the trees had lots of parasytic lychen on them. 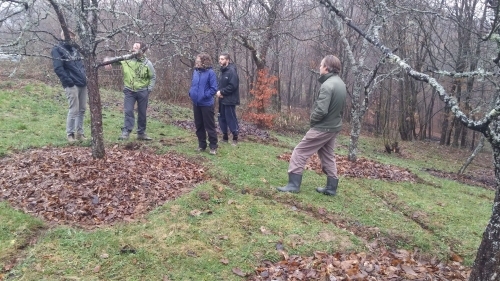 On the PDC with Rosemary Morrow I heard about the "Net and pan system" for orchards like ours. 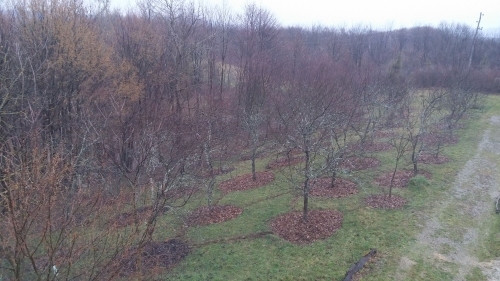 The idea is to make circles around the trees (as wide as the branches reach), mulch them, and connect those circles. This slows down the water, and leads the overflow from one tree(circle) to the other tree(circle). Another benefit is that the circles accumulate leaves and build soil. So we implemented this net and pan idea and it worked really well! 2 Of our orchard problems were solved: there was much less grass to steal nutrients and water, and we had a rainwater catchment. 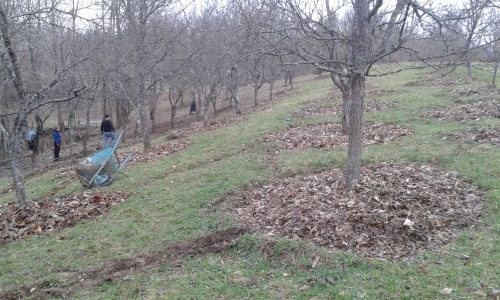 In the circles we put heaps of leaves from the forest as mulch, and we planted some companions for the plums. - White clover as a nitrogen fixer. We sowed this in the grass around, not in the "pans". We pruned the trees lightly. Plum trees you prune in May and after the harvest in September. With these pruning sessions we brought more sun into the trees and we took away branches that were damaging other branches. That the orchard is on a north side, is actually not a problem but a good thing. In spring our trees blossom later, and that already saved our plums two years out of 7! While our neighbours see their plum flowers killed with a late frost in spring, our trees were not even blossoming yet. What also helps: in winter and early spring we apply a thin layer of the white clay (kaolin) from (deep in) our soil on the fruit tree trunks, to reflect the early sunlight. Therefore the trees blossom a bit later (when there's less chance on night frost). The kaolin is also a repellent for bugs. The internet told me that lychen were not really a problem for trees. We easily brushed them off with an old broom and we'll leave it like that.